Shorter days + cooler nights = more time in the kitchen. Add to that equation some Acorn squash, some Granny Smith apples and a few Shitake mushrooms and you’re golden. While battling a wicked cold today, this seemed to ease the congestion a bit–especially with the Turmeric. Enjoy! Heat olive oil in a 6 quart saucepan over medium-high heat; add onion, and cook, stirring often, until lightly browned, about 15 minutes. Add ginger and garlic, and cook, stirring, for 1 minute. Add turmeric, five-spice powder, squash, apples, and salt and pepper, and cook, stirring, until fragrant, about 2 minutes. Add stock, and bring to a boil; cook, covered and stirring occasionally, until squash and apple are tender, about 15 minutes. 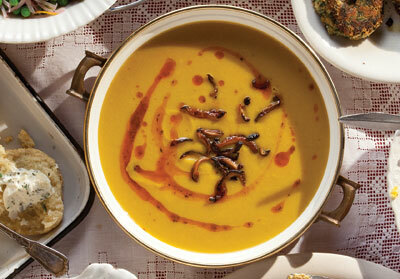 Using an immersion blender or food processor, puree the soup and then return it to saucepan. Stir in the lime juice and keep warm. Meanwhile, heat canola oil in a 2 quart saucepan over medium-high heat until a deep-fry thermometer reads 350°; add mushrooms, and fry until browned and crisp, about 3 minutes. Using a slotted spoon, transfer mushrooms to paper towels to drain; set aside and reserve oil for another use. Wipe saucepan clean and add butter, mint, cumin, paprika, and salt and pepper; heat over medium heat, and cook, stirring, until melted and fragrant, about 5 minutes. To serve, ladle soup into bowls; drizzle each bowl with some of the spiced mint butter and top with some of the fried mushrooms.